Udderly Smooth Cream has rich moisturizing ingredients. Udderly Smooth Cream can be used on Dry Skin, Cracked Skin, for Diabetes Foot Care, as a General Moisturizing Lotion and many other uses. Developed by a Pharmacist and used as a cow udder cream, people around the world use Udderly Smooth cream daily for smooth, soft skin head to toe. It is the udder cream for hands, feet, & body. And yes, this udder cream also works on faces. 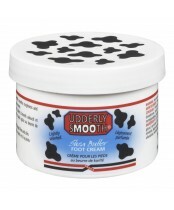 Look for the packaging with the black and white cow spots, and try it and get Udderly Smooth.